The downstairs cafe is a small and cosy shop space for comfortable chats and warmth, perfect for these chilly days we’re experiencing in Scotland and across the UK. 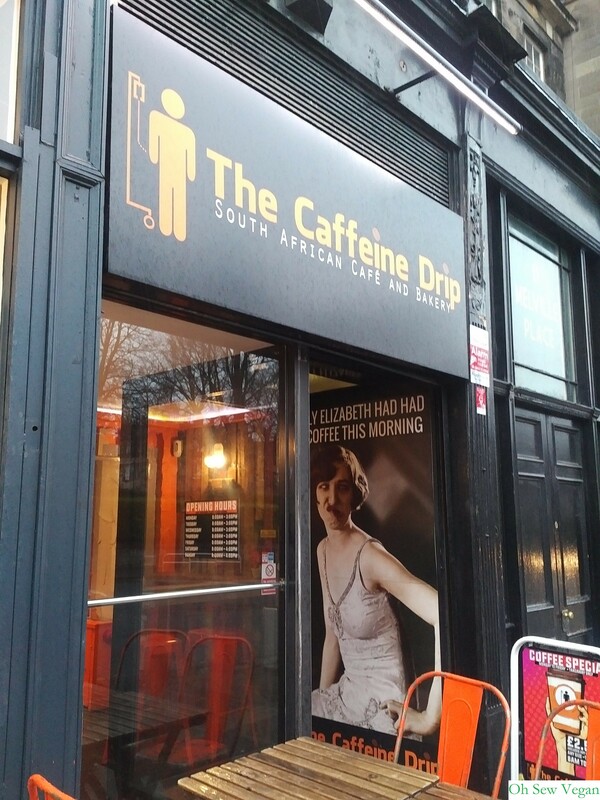 The Caffeine Drip is owned by Chris (who previously opened the Zulu Lounge on Morningside Road) and his partner, Dariusz. After a trip to Chris’ hometown in South Africa, both decided it was a great venture to introduce South African flavours to the cosmopolitan city of Edinburgh. We’re sure glad they decided to! 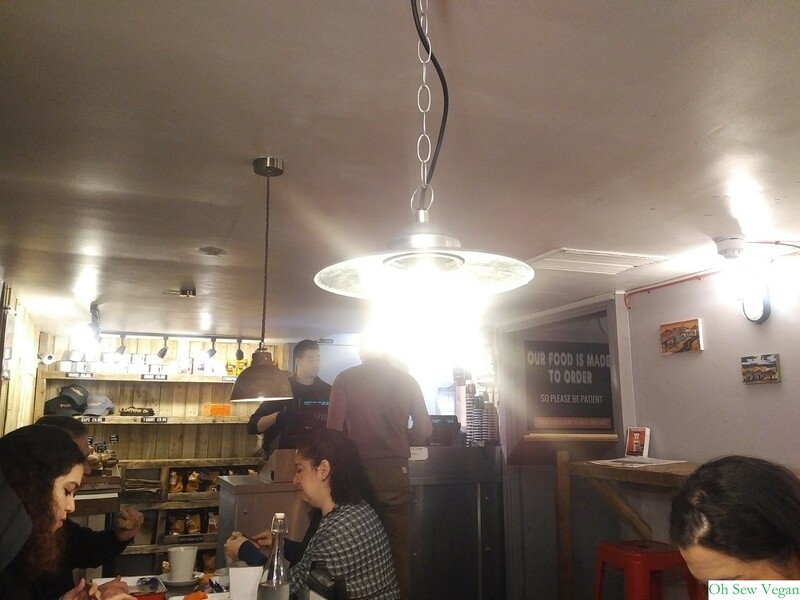 Of all the non-vegan cafes and restaurants I’ve visited so far in Edinburgh, I have to admit that, by far, The Caffeine Drip, is the most vegan-friendly. 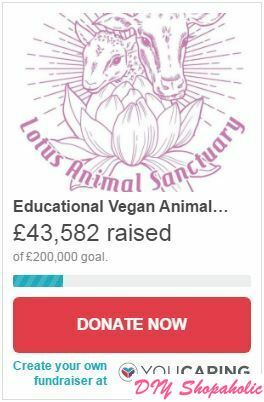 For almost every item on the menu for non-vegans, if not all, there is a vegan alternative available including French toast, CYO (create your own breakfast) and hot/cold drinks served with soy, almond or oat milk. 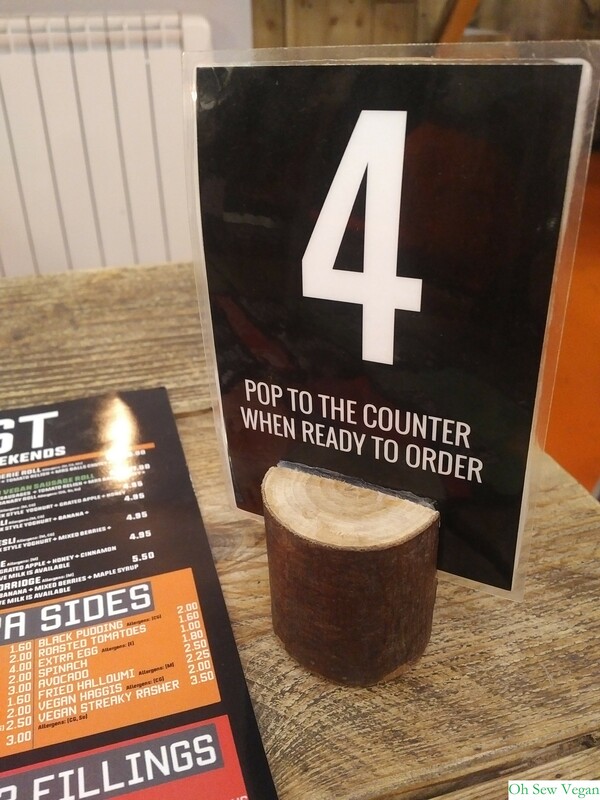 They also usually have a vegan soup and baked treat as well on offer. The decor is unique in that it gives a somewhat rustic feel to it, with scaffolding wood, recycled furniture and photos taken by Chris and Dariusz lining the walls. I had a hard time deciding whether I really wanted a French toast or if I should try some of the other great dishes on offer. If only we could fit more in our tummies! I decided to stick with the French toast with streaky rashers from Sgaia’s Vegan Mheats and maple syrup. To keep myself warm in the cold weather and fend off any potential colds and flus, I ordered a turmeric latte with soy milk. I love my French toast with maple syrup, but I wasn’t expecting the slabs of bread to be as thick as they were! The slices of germagrain toast were soft and doughy dipped in chickpea scramble which gave it that slight fried texture on the outside. I’ve tried Sgaia’s Vegan Mheats at different markets and events and always enjoy what they offer, but this was my first time trying their streaky rashers and they do not disappoint. It was a very hearty brunch I had when I met up with my friend Jen from The Sustainable Edit for a chat. 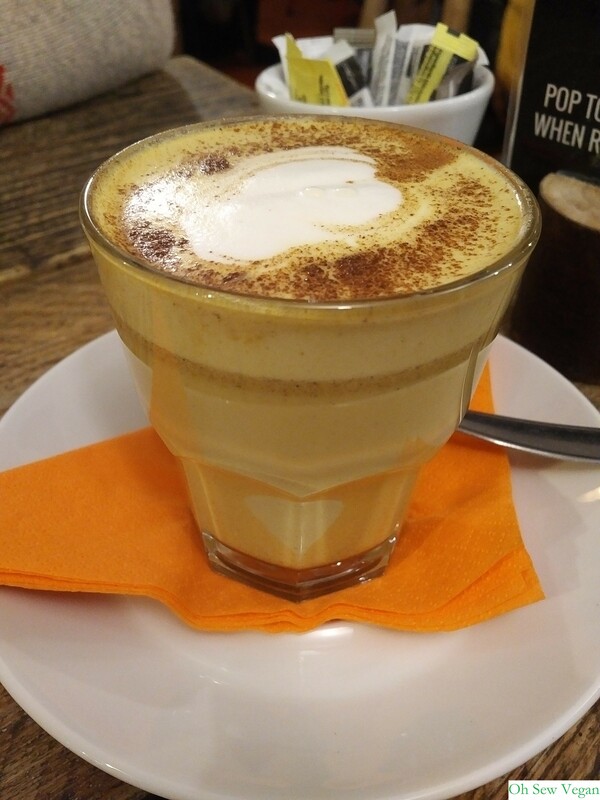 The turmeric latte was lovely and thick, just how I like it. I’m not a big fan of overwhelmingly strong flavours, so this latte was a lovely combination of spices to warm you from the inside. It was also a generous sized glass which kept me going while I devoured my French toast. The prices are very affordable and reasonable for the portion sizes you get and I thoroughly enjoyed my French toast. 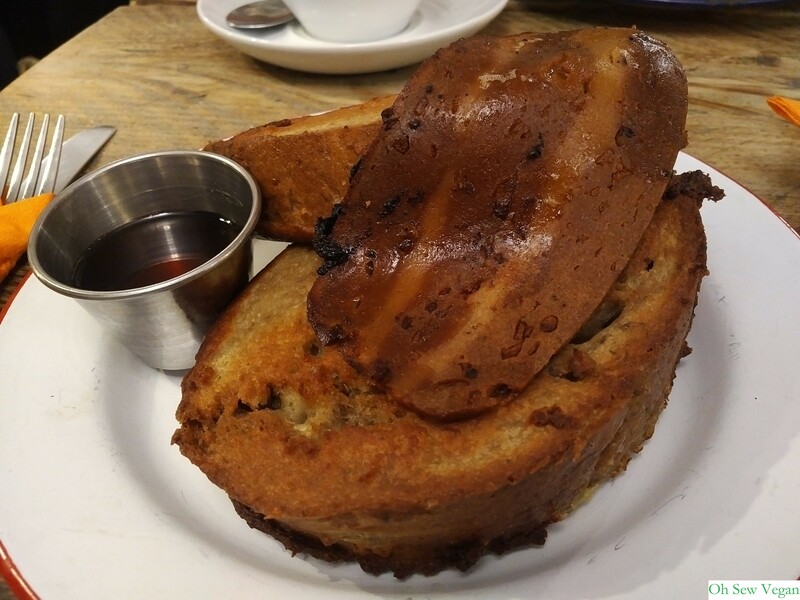 In addition to ordering a savoury French toast with streaky vegan rashers, you can also order it with other toppings such as haggis, fried banana or mixed berries to name a few. I can’t wait to bring friends and family back to The Caffeine Drip just so I can sample more of their vegan dishes! To see the full list of vegan options, see their menu here. Because the small cosy cafe is a downstairs establishment with limited seating upstairs, The Caffeine Drip doesn’t take reservations and runs on a first come first served basis, but if you’re happy to wait to be served, I promise you won’t be disappointed. 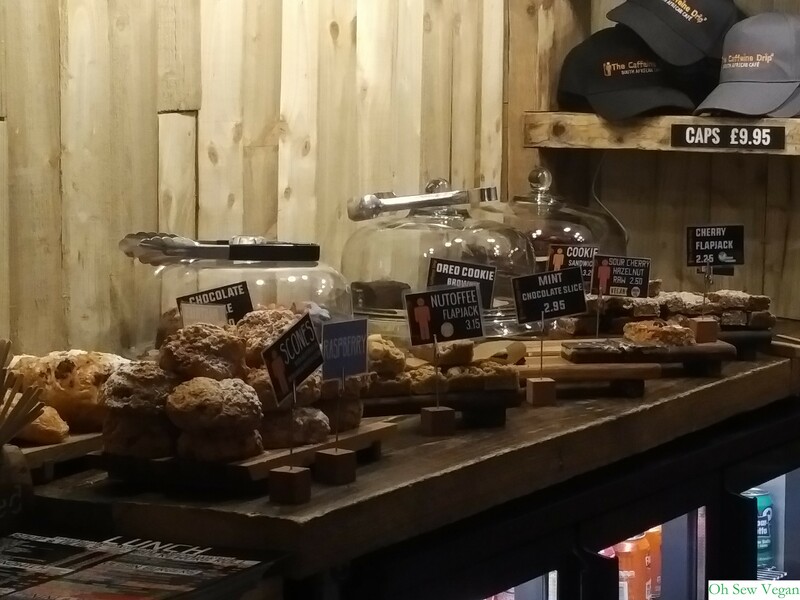 The Caffeine Drip is located at 10 Melville Place (just at the end of Queensferry Street), EH3 7PR and they are open every day from 8:00am (9:00am on Sunday) until 3:30pm Monday to Friday and 5:00pm on Saturday and Sunday. For enquiries, call 0131 538 0805 or send them an e-mail. Have you already been to The Caffeine Drip? What’s your favourite vegan dish?